From repair to brand new JC Builders can work with you to complete your deck project. We are a trex composite decking certified installer but are also very qualified to install whatever decking product you choose. 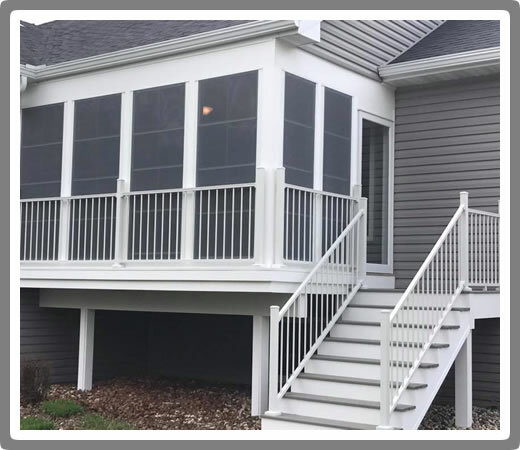 If the bugs get the best of you in the summer and make enjoying your back yard pretty much impossible, we can also offer an enclosed screen porch to fight the forces of nature without sacrificing the view of your yard. If you are looking for a contractor who is professional, provides quality workmanship, has great follow up and cares about their customers, then JC Builders Inc is the contractor for you. Our commitment has and always will be total client satisfaction. We approach every one of our projects as the only project we are working on, so you have our full attention and focus.